On our street stall recently Focus E15 campaigners met Ibrahim, a refugee who was left to sleep on the streets of the borough of Newham for months due to the inadequacy of the council and their unwillingness to give refugees and other residents in the borough stable, secure housing. Unfortunately it is clear that Ibrahim’s story is not an isolated case. A crisis in housing has been unfolding for decades and is only set to get worse when the Immigration Bill comes into law later this year. This Bill proposes to build on the measures in the Immigration Act and to extend document checks by landlords and banks to stop undocumented migrants from renting housing or opening a bank account. Landlords could have the powers to evict migrants without a court order making the present situation even worse. The Focus E15 campaign believes that the recent request from the government to every council, asking them to house 10 Syrian refugee families, is not only inadequate, but shameful when the reason so many refugees from around the world have had to flee their homes is due to the wars waged in the interests of,(and financed by) our capital and country. We encourage people to stand together, as humans, to say 10 families per council is not enough. If our local council, Newham in East London really wanted to help refugees, they should rehouse people on the Carpenters Estate where 400 flats have been boarded up for several years. We are demanding safe and secure housing for all who need it! So councils in London, in solidarity with people around the world needing safe stable homes, it is your responsibility to open the 22,000 empty homes in the capital and immediately start rehousing people. 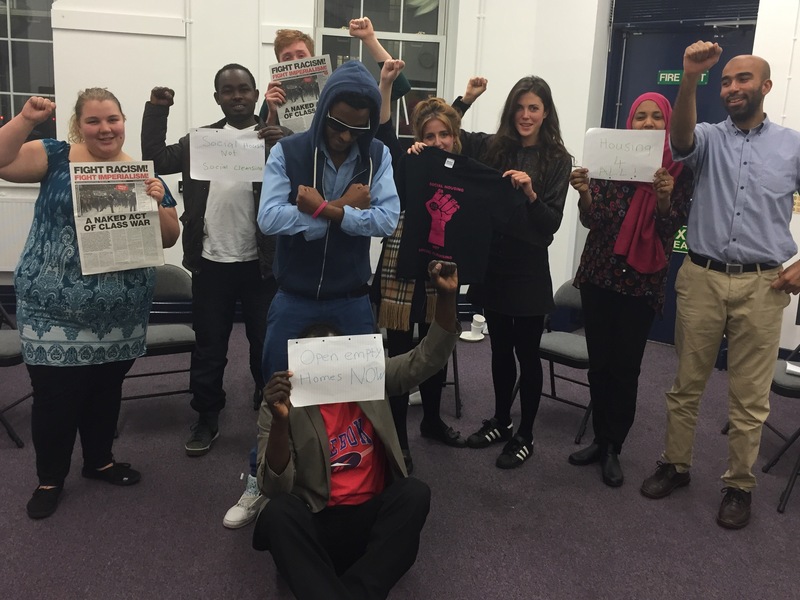 Focus E15 campaign will be present at the demonstration for refugees in central London on Saturday 12 September. Please join us there. Bailiffs sent away! Mostafa still at Sweets Way! Great work from Sweets Way! On Monday, people kept a family from being evicted and pushed a council to reverse the decision that would have left them homeless. But we need to keep up the pressure to keep Mostafa and the family safe. Yesterday many of us were prepared to be arrested. Not by choice, but because we had seen what Mostafa and his family had gone through, and we had seen them failed over and over again by the various systems that are meant to protect people in their positions. 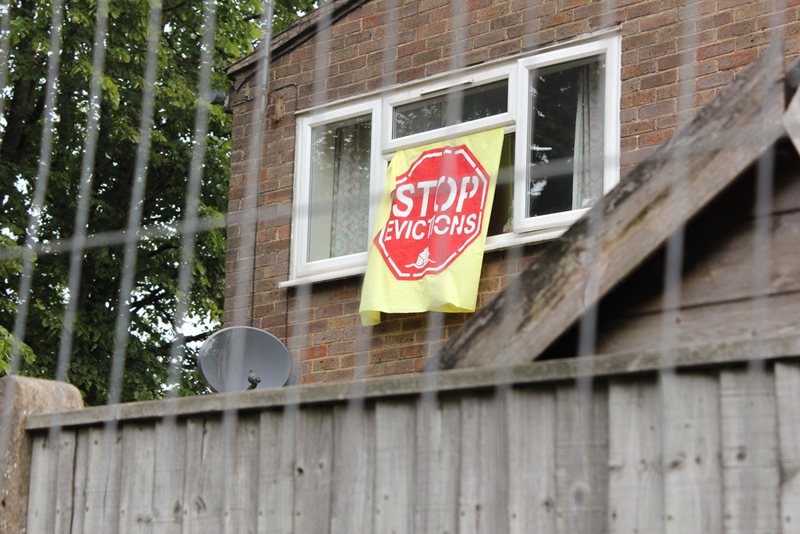 We were prepared to do everything peaceful within our power to stop High Court bailiffs from entering the home of the last family at Sweets Way and making them homeless. We were prepared to do this knowing that doing so could constitute a criminal offence that could be left hanging over our heads for the rest of our lives. Newham council has withdrawn the offer of temporary accommodation in Birmingham to a single Mother of 3 and cancelled her housing appointment on Friday 29 May, therefore she does not need people to stand with her at Bridge house. We are awaiting news as to where she will be housed next by Newham council and hope that she will now be able to settle and bring up her children with support from her wider family. Thank you for all the messages of solidarity. We will pass them on to this family. It is clear that people need long term and properly affordable housing. 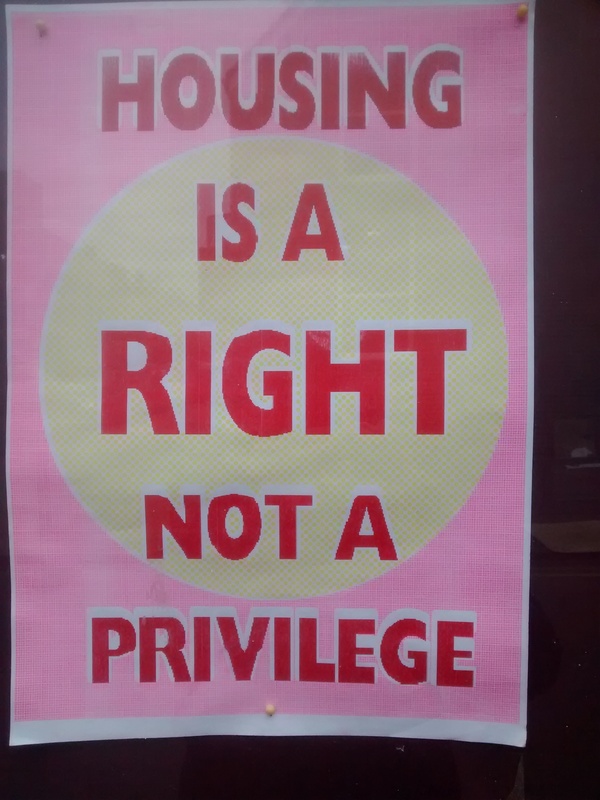 Social housing not social cleansing! Stop sending mothers and children away from their support networks! Victory! No charges to be brought against Jasmin Stone of Focus E15 campaign. 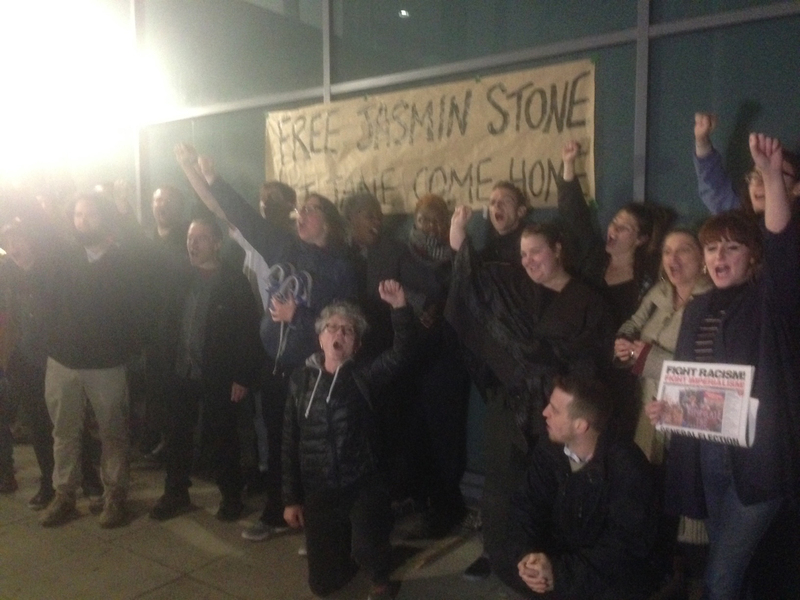 On 13 April, Jasmin Stone of Focus E15 campaign was arrested on suspicion of squatting in a raid organised by Newham council and police. There followed a loud and militant demonstration at the police station where she was held and she was bailed to attend a police station in mid May. We have just heard that no charges will be brought against her. The lead up to the police and council action was Focus E15 campaign supporting Jane Wood who had lived in Newham council accommodation, east London, for almost 21 years. On 24 March she and her 14-year-old daughter were evicted by bailiffs for rent arrears resulting from complex personal and medical circumstances leading to her Employment Support Allowance being stopped. At the last minute, when her family rallied around and offered to pay the outstanding debt, the Labour council refused to take the money, call off the bailiffs or allow Jane to keep her home. Newham council is led by Labour Mayor Robin Wales, an unashamed advocate of gentrification, supporter of sanctioning and kicking out the poor and most vulnerable. Under his rule, 400 homes on the Carpenters’ Estate remain empty, while homeless people whom the council is compelled to house are forced to move out of London. This is an example of political policing and a targeted arrest in an attempt to silence and intimidate political activists. We will not accept the criminalisation of those who fight for social housing and against social cleansing. Focus E15 campaign will be celebrating this victory on the weekly Focus E15 stall this Saturday 16 May from 12-2pm on The Broadway, Stratford E15, outside Wilko’s. The posters read ‘social housing not social cleansing’ which has now become the rallying cry for many different housing campaigns across London and the world! 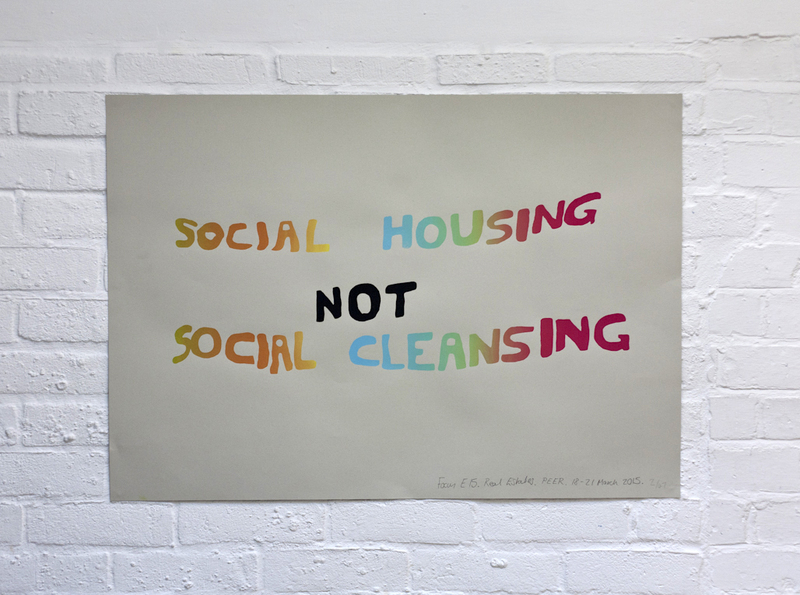 The posters were created on behalf of Focus E15 as part of the ‘Real Estates’ exhibition at PEER gallery, which was a project that was run by Fugitive Images, from March 18 -21st 2015. The posters cost £12.00 + £5.50 p&p. All the posters are limited edition, signed, screen printed exhibition posters, 840 x 604 mm. Profits from poster sales go directly to Focus E15 campaign. *please note that colours will vary for each print. Please see Gina Lundy’s website to purchase a poster. On 26 March housing activists from the Focus E15 campaign, HASL and FRFI joined together outside Bridge House, which is the housing office in Stratford E15 (in the London borough of Newham) to support Shelica, a homeless single mother of two. The Focus E15 campaign met Shelica at our weekly street stall in Stratford and offered to support her. She had been told she was likely to be moved out of London to Hastings and would never come back. This is Newham Labour council operating a policy of social cleansing. Social cleansing causes a great deal of distress for the people targeted.Such a move for Shelica, away from her family and support networks would prove to be disastrous for her and her two young children, almost certainly leading to social isolation and stress. However under pressure and with publicity, the council changed its mind and realised that they could find temporary accommodation for Shelica in London after all. During the protest, all the housing activists acted peacefully and made sure that anyone going into the housing office was allowed to do so. We are extremely concerned that Bridge House decided to shut down the housing office, turning its back on Newham residents in housing need. Newham Labour council is also responsible for boarding up flats on the Carpenters Estate, which is right next to the housing office. These homes need people. Social housing! Not social cleansing! On 31 January 2015, people from across the capital are marching on City Hall to demand solutions to the housing crisis and better housing for Londoners. The March for Homes has two assembly points – the East London ‘leg’ starts at 12 noon in Shoreditch; the South London ‘leg’ starts at 12 noon in Elephant & Castle. There is also an accessible short march starting from Potters Field SE1. The two ‘legs’ plus the short march will meet to protest together at City Hall, where a rally will be held from 2pm. The East London ‘leg’ is led by community housing campaigns Focus E15 and New Era – supported by a wide range of groups and individuals including tenant organisations, trade unions and housing campaigns, London MPs and London Assembly members. The March for Homes was initiated by Defend Council Housing, the South London People’s Assembly and Unite Housing Workers. Supporters of the march include: Defend Council Housing, People’s Assembly (London); community campaigns New Era, Focus E15, Fred Wigg & John Walsh, Our West Hendon; renters campaigns Generation Rent, Hackney and Tower Hamlets private renters; trade unions BECTU and Unite Housing Workers; Disabled People Against Cuts (DPAC), Radical Housing Network, Trade Union and Socialist Coalition (TUSC), London Green Party and the Revolutionary Communist Group. Correction regarding the case of Zineb Saafan -Newham council employee. The initial housing offer from Newham was in fact within London, near Mill Hill, Barnet. We apologise for the initial inaccurate information that suggested the offer was for outside London. However the combination of distance and travel costs across London make this offer practically impossible for a single mother of three young children to manage, as Zineb works 16 hours a week, on minimum wage for Newham council and her child attends school in Newham. In response to Newham Council’s statement issued on 19/01/15 (regarding the case of Zineb Saafan). The campaign was approached by Zineb on Saturday 17/01/15 at the end of our street stall. Zineb came to ask for help because she had been evicted from private rented accommodation and was homeless. She was with her 3 children and was clearly upset. She had nowhere to go. On Monday 19/01/15 the Focus E15 campaign called for a peaceful demonstration outside Bridge House to support Zineb -at her request. However the council refused entry, closed the building and called the police. As we caused no hindrance to other people there was no need for the council to close down the housing office and deny people their housing appointments. The eviction of Zineb and her family is only one example amongst many that this campaign comes across on a weekly basis during the street stall in Stratford. In Newham the skyline is increasingly dominated by luxury apartments whilst council estates like the Carpenters Estate are left empty. We will not tolerate people being ripped from their homes, from their work and from their schools. Our messages are clear: Repopulate the Carpenters Estate! Social housing not social cleansing! On Friday morning, Zineb, a single mother of three who works part-time for Newham Council was evicted by a private landlord, leaving the family with nowhere to go. Zineb went to Newham Council’s Bridge House at 11am to declare the family homeless at which point she was offered temporary accommodation two hours outside of London. Upon rejecting the offer because of what it would mean for her job and her eldest daughter’s school, she was deemed to have made herself intentionally homeless. She refused to leave Bridge House and council workers called the police, who took her to Forest Gate police station where the family had no choice but to stay overnight, in the lobby, sleeping on the floor. The next day she came to the Focus E15 campaign stall and asked for help. We immediately put a message out to our networks and were able to find emergency accommodation in Newham for the weekend. On Monday 19 January people from Focus E15 campaign will be accompanying Zineb and her children to Bridge House and expect Newham Council to find accommodation for this mother and Newham employee in reasonable reach of work and school. After a fantastic year for our campaign we are going to be celebrating by having a Hats & Wigs New Year’s Eve party at the Carpenters Arms pub on Carpenters Rd E15 in Stratford. Come and join us for a special celebration. Playing live on the night with be the all female post punk band Gertrude and then giving us all some cabaret decadence The Bohemianauts will be joining us to see us into the New Year. Polish up you dancing shoes for the lovely Focus E15 Djs. £5 suggested donations. To stay up to date with this event, please join on facebook. We hope to see you there!